Painters disconnected is a series of mobile phone screnshots showing Google image search for paintings of famous painters as they are shown before the web pages load. What they reveal is a mosaic of images with a predefined layout and color scheme for each search/artist. The color-coded Moondrian-like series of squares only becomes visible in cases of a slow Internet connection, pausing the seamless high-speed transfer of data. This pattern also reveals algorithmic decisionmaking as to the order of images, becoming a catalog in itself. 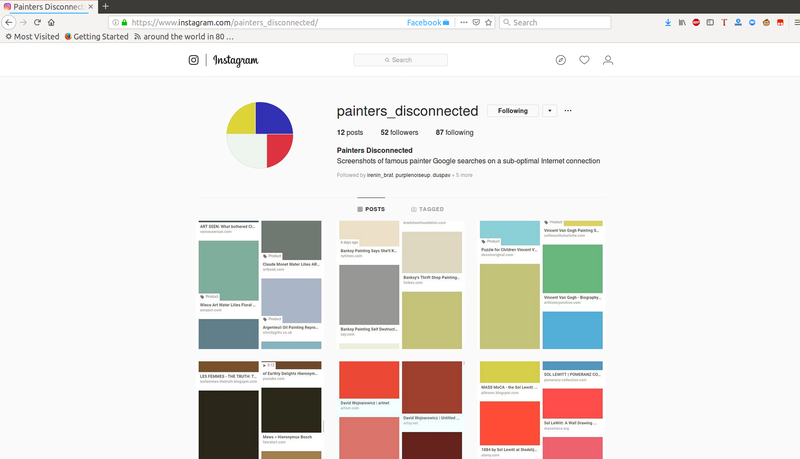 Image search collections are archived per individual painter on an account (@painters_disconnected) on Instagram, one of today's most popular exhibition catalog places. It was developed in the context of Monoskop.org installation for the 10th edition of Seoul Mediacity Biennale, exploring the notion and medium of *art catalogue*.